Once again, its time for Farley's "Currently" and once again, I'm absolutely amazed that another month has flown by! I'm linking up and you should, too! As I said, I am in LOVE with the "Swingin' Christmas" station on Pandora. It's all the classic Christmas songs with not a HINT of contemporary...well, except for Harry Connick, Jr (Swoon!) and some Michael Buble. I really used some restraint this year and made myself wait to even listen to Christmas music because I feared early-holiday-burnout. Even my hubby, who seriously protested my music choice, was caught humming "Do You Hear What I Hear?" yesterday. That makes my holiday heart smile! Every year I'm so moved by seeing people get into the season! Folks putting up their decorations, making memories, and displaying general attitudes of cheerfulness & giving. I try to see the GOOD in people and the holidays always provide lots of opportunities to be inspired by the actions of others. Just recently it occured to me that we have only about 2 1/2 weeks until Christmas break! We're lucky and have Monday the 2nd off as part of our Thanksgiving break. Add in the craziness of taping our annual "Kids n' Christmas" segment for local TV (which takes 2 days at our school since we are the host location for all the local elementary schools) and we've got a crazy week on our hands! My plan is to strategically mix the fun & essential activities we need to do to close out the 2nd grading period. Wish me luck! It's going to go so quickly! I know, I know, if you know me, I say this EVERY year! I start with the best of intentions, but somehow those intentions usually transform into hectic to-do's and somehow the JOY gets taken out of things. I'm determined to NOT let that happen this year. I want to enjoy the season...after all, it only comes around once a year! Well, this kind of goes with my "wanting", because if I would actually complete the things on my "list" in good time, I wouldn't feel so rushed. I'm using tomorrow as a "catch up & get ready for the holidays" day. I love baking day with my Mom! We listen to Christmas music, crack each other up, and make holiday treats for sharing with friends and family. We make messes, "Shoo" the men out of the kitchen, and just have the best time. I can't wait to see what we come up with this year. I hate to say this on the 1st, but January will be here before we know it! 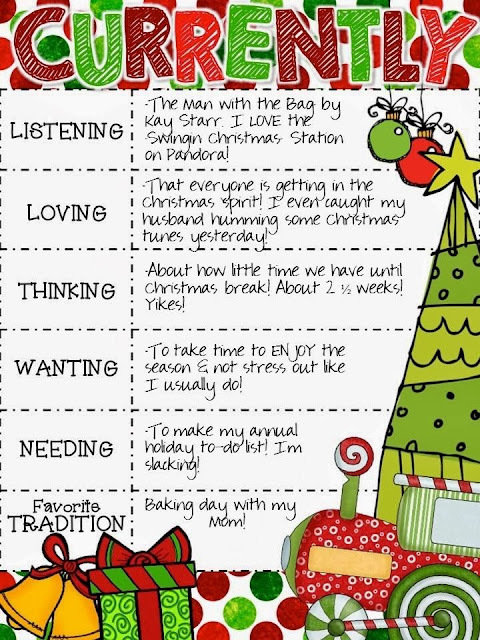 I hope that you all can take some time this month to sit back and ENJOY yourselves this holiday season! Sending you the HAPPIEST of holiday wishes! Also: My TPT store is on sale for the Cyber Monday (and Tuesday) sale! In anticipation of Thanksgiving and the fact that we have a wonky week, we got our craft on yesterday and made tie-dyed turkeys! Huge surprise here...the inspiration for this project came from PINTEREST! 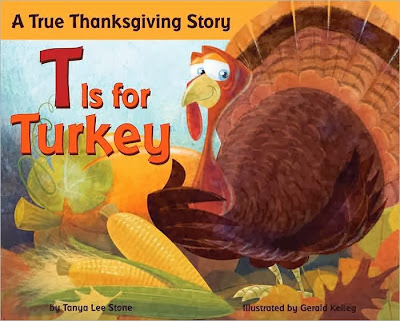 First, we read a Thanksgiving book- T is for Turkey by Tanya Stone. I love the vocabulary words in this book! We've been reading so many Thanksgiving books lately and I love to hear my students make connections. I made a big deal about learning something new from this book...I did not know that the Pilgrims' clothing was brightly colored. I'd just always assumed they wore the black & white outfits that I'd always seen in books. I've been duped! We followed up our book with a discussion about being thankful. It's kind of a hard concept for some of them, and I understand that. To explain what "thankful" means is tricky! We've had lots of talks about family, friendship, and being glad for everything that you have. I got them thinking about what they were thankful for and why. We started writing about the various things we were thankful for and the reasons why. Some struggled, some soared, and by the end, everyone had made a "sloppy copy", had a short editing session with me, and had produced a final copy that was worthy of a hallway display. They put their final copies in their "ketchup" folders (red folders in their desk for work they need to "catch up" on) and got ready to craft! Everyone received a coffee filter and colored designs on them with fall-colored markers. When the students were done with their filters, they brought them back to the reading group table & folded them in half, and then in half again..a la snowflake style. A few sprays of water and a little squeezing to distribute water through the filter and they had some pretty cool creations! While we waited for them to dry, we assembled our turkeys. I distributed small pieces of brown construction paper and tracing guides (I've also seen this project done with a tracing of the child's foot, which would be adorable, but I am NOT up for painting feet!). Students traced their turkey bodies and made beaks from little scraps of orange construction paper. Paper punched circles made the black eyes. I love how they're all just a little different! Luckily, the coffee filters dry pretty quickly...especially when placed on a layer of paper towels. When they dried, we assembled our projects! We stapled the final drafts of our writing onto the construction paper, and then glued the coffee filters to the top, as well as the turkey bodies. Out in the hallway they went! I am thankful for the whole entire country. I am thankful for them because they keep me safe. I am thankful for my family because I have a warm bed. I am thankful for my neighbor, Diane. It started with a single "gobble gobble" and at one point, half of the class was "gobbling"! I just smiled & remembered how it felt to be a student doing crafts at her desk...especially right before a holiday break. The glue..the scissors...the excitement as the project took shape...and the fun! Oh, to be a first-grader! So thankful to be their teacher! TGIF, Hallelujah, and Raise the Roof! It's Friday! 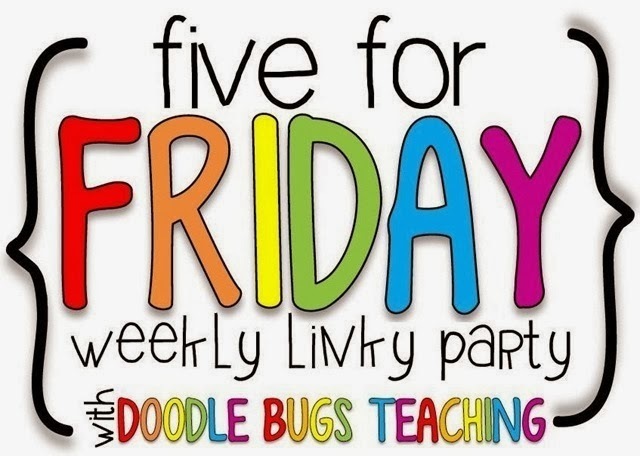 I'm linking up with Doodle Bugs for the Five for Friday linky! 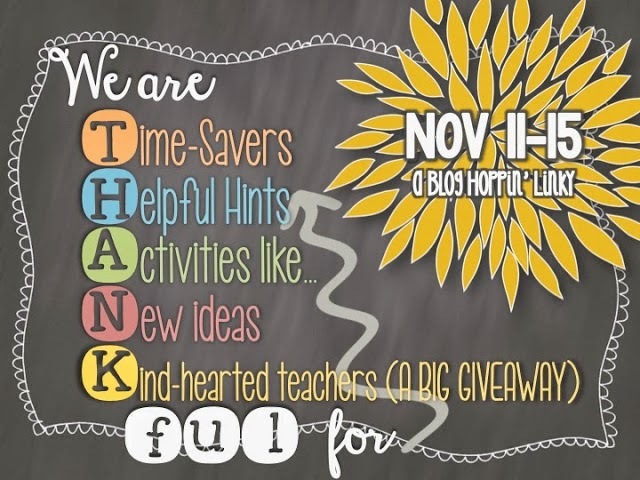 While we spent the next day sleeping, complaining (getting sympathy from a spouse when they're ALSO sick is nearly impossible), and sleeping some more, I was thinking about my students and wondering how they were managing with the thrown-together plans I'd e-mailed to another teacher at 6 in the morning. Preparing for a PLANNED day off can be crazy, let alone plans you pull together from what you THINK is what you left on your desk. Oy! When I returned this morning, I found this picture on my desk. Instant smile-maker. Hearing "I missed you, Mrs. Colon!" never got old. The hugs were warm & genuine. It made my heart smile to know that they missed me. 2. With minimal coaxing, my sweet husband left the warm confines of the couch after dinner on Tuesday night to drive me out in the country to see the Minotaur 1 rocket launch, which you could supposedly see in my Ohio skies. Out we drove, on dirt roads and highways, seeking the perfect spot with a south-easterly view of the sky. (The above photo is of the compass on my phone) I actually streamed video of the launchpad and listened to Mission Control and their various checks of equipment and whatnot as we drove. It felt so official. It was so much fun. That is, until we DIDN'T see anything special. At least, not in the rocket-launch way. We did, however, see a GORGEOUS moon that illuminated the sky with a buttery-colored light. We saw stars upon stars upon stars. We saw a red fox on our way home! We saw the drive-through at DQ because star gazing makes us want ice cream! Adventures like this, on Tuesday nights, are my favorite. 3. Does the desk fairy visit your classroom? I visited your desk last night and sat down in your seat. I left a little treat for you because it's nice and neat! If you'd like a copy to use in your own room, click HERE! 4. I've been getting a lot of no-name papers lately. Somehow, I'd forgotten how effective this trick can be! I'd stashed my can of highlighters on a hidden shelf from last year and came across them recently. Plucking them down on the table led to lots of "What's that?"' and "Do we get to use those?" Having students highlight their names before they put their papers in the "turn in basket" can led to a HUGE decrease in no-name papers! Kids go nuts for highlighters and I've found that they hardly EVER pass up a chance to use them. 5. Have you been to a painting party? This week my Mom and I attended one at a local winery and had SO much fun! We snacked, we sipped, we listened to classic Christmas music, and we created holiday paintings! Even though I love all things artsy and craftsy, I was seriously doubting my ability to be able to create something I didn't want to throw out the window on the way home. Much to my surprise, I was TOTALLY capable! I tried to remember to photograph the various stages of my painting. Here's the metamorphosis! That's paint on the plate...just in case you were wondering if that was a snack. If you have the chance to attend one, please do! I can't wait for my next one! 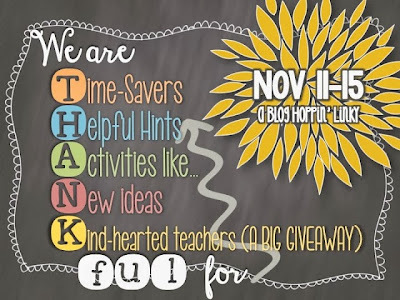 I'm back for Day 4 of Blog Hoppin's fun linky. Today I'm talking about NEW IDEAS. Here are some things that I've recently begun doing that are making my life a little better! 1. My students FREAK OUT when I color the staples in my stapler! 2 minutes, a handful of sharpies, and BOOM! You've got something that will make you & your students smile every time you see them. So cheerful! They're fun to make, too! When I staple spelling lists into their agendas each week, they can't WAIT to see what color staple they'll get! I haven't yet unveiled my diagonal-striped staples, which will give a multi-color design. 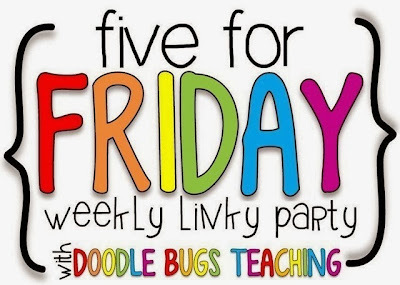 Something little like this is a really big deal to my kiddos- and I love that! I'm looking forward to the mayhem on Monday morning! 2. 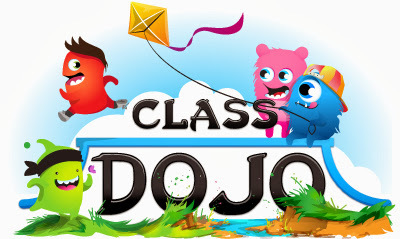 Class Dojo! This is a new thing in my room this year and so far, I'm getting great results! Each student has their own "account" and avatar (that they can customize themselves at home). Throughout the day they're rewarded (or deducted) "dojo points" that are tabulated, then reset, each week. I offer dojo points for arriving on time, leadership, behavior, effort, kindness, and honesty. Conversely, dojo points are also deducted for negative behavior in these areas. Each Friday, parents who have provided me an e-mail address are sent a behavior report. It shows points received and deducted and any comments I might have made. I usually enter comments at the end of the day. I received a lot of good feedback from parents at conferences. Students are proud to go home & ask their parents to check their Dojo account & tell them about their day. I use the computer, iPad, or my iPhone for this program. That's another reason it's so handy...it can be with e in my room, or really, wherever we are, at all times. When I'm working with small groups, I give points to students who are on-task. The Stamina King or Queen (from the Daily Five) gets extra points, too. What's funny is that we really don't do a lot with these points. They're not converted into prizes, or rewards. I"ve found various ideas but, to be honest, I know I'd NEVER keep up with a system! Somehow, the students still care how many points they have each day. It's kind of wacky, but it's working. PLUS...the data is saved for each student and can be excellent evidence for behavioral intervention meetings/plans. Knock on wood, I've not had to use it for that, yet. I really get to use the system for rewarding great behavior. 3. This isn't really a school idea, but its what's motivated me to get up this week, so I guess it kind of is! Gevalia Kaffe (I crack myself UP saying that) has made a 2-step coffee drink that gets two thumbs up from me! My best friend (hey, Cass!) brought these to my attention last week and then I came across them at the grocery store. Basically you put the "froth" packet in your cup first, then you brew the K-cup of espresso on top of it. It foams! It smells amazing! It's frothy goodness in under a minute! Like I said, it's been my motivation to get up & shuffle downstairs in the morning! They have other flavors too, I think, but this was the only one I could find. I'm excited to see what else they've got. Have you tried them? What do you think? 4. To know me is to know that I'm KIND OF an Erin Condren fan...hehe. I started with my first Life Planner last spring & have since become a fan of her Lesson Planner, lunchbox kit, and even her PENS! I'm now on my 2nd Life Planner & have to say, it's one of my favorite things! I'll admit though, when I saw the lesson planner pages, I was wondering HOW I was ever going to organize everything I needed into those tiny spaces?!? Luckily, a smarty-smart teacher (Mrs. Magee from First Grade Brain) created a lesson-planner template that makes lesson planning SO much quicker & organized! It's FREE on Teachers Pay Teachers...if you have an EC Lesson Planner, you'll want to check it out! I'm excited to read about the new ideas you all have to share! I'm back for day 3 of this Blog Hoppin' linky! Today's focus is on favorite activities you've done with your class. I recently did a project with my first-graders that we displayed in the hallway during parent-teacher conferences. It was a big hit! I called them "Student Silhouettes"
"My favorite food is Klondike bars." I love it! The inspiration for this project was from...big surprise here....PINTEREST! We began this project by taking profile pictures. I had students come up to the smartboard (not turned on) and stand on a designated spot on the carpet, facing the side wall, so I could get a good profile shot against a white background. Once I had taken everyone's photo, I made them full-page size on Power Point. I then printed them on regular paper (cardstock would have been sturdier, but harder to cut out details, I think.) I then cut them out with scissors. I also could have used an X-acto knife, but the scissors worked just fine. The pictures were big enough to be able to get little details like hair & noses. Then I had a collection of these! (*Hindsight tells me that NEXT time I do this, I'm going to print them off in black & white. It would have saved some ink, and we found that the tempera paint doesn't want to stick on the printed side of the picture anyway). Students also worked on the WRITING part of this project by answering some sample questions about themselves, with a focus on sentence structure, capitals, punctuation & spaces. Questions like: How old are you? What is your favorite food? What is your favorite color? What is your hair color? We made "sloppy copies" first, edited them, and then wrote final drafts to be hung underneath the completed silhouettes. As with most first-grade writing endeavors, this became a multi-day process that was a little messy, but a lot of fun! I then called students back to the small-group table to paint their faces...their paper faces! We covered the table with paper & used scrap-paper to lay the silhouettes on as they were being painted. The first group decided to try & paint the printed side of the paper. This did not go well! The paint wanted to kind of pool up in spaces, like there was Rain-X on it or something! We quickly blotted them off, let them dry, and painted the BACK side of the silhouettes with better results. ...quickly became an "Oh, *$! @" moment! The paint wasn't sticking! Once the silhouettes were dry, we glued them to the MIDDLE-TOP of our construction paper. We mounted the final copies of our writing below. I also made an extra-copy of the original face-pictures to be put UPSIDE-DOWN and at the BOTTOM of the backside of the construction paper. That way, people can simply lift up on the bottom of the construction paper to find out the student. My hair is red. I love the little sticky-outie piece in the profile. It's SO that kid! My own little Opie! The students all went home & told their families so parents were also excited to see the finished products! It made for a nice activity for parents to check out while they waited in the hallway for their turn at parent-teacher conferences. It was cool to see the parents pick out their children & laugh at the answers to their questions. I think this will be a keeper activity for years to come! I'm excited to read about your favorite activities! Link up & share! I'll be back tomorrow for New Ideas!